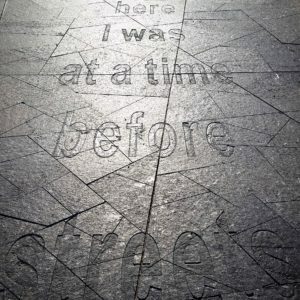 Working in a form he calls “architexture” Calgary artist Derek Besant’s artwork creates a “walking tour” of the Quarters. Placed at each midblock crossing along the Armature, the poem(s), sandblasted into the granite crossings, can be read backwards, and forwards. WALKWAYS invites pedestrians be mindful of their surroundings and stories as they follow the narrative between benches, across the street, and through the neighbourhood.